Lead generating landing pages, opt-in forms, and launch pages for everyone. 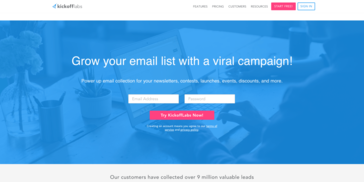 Get a Viral Boost with built-in referral tracking & email marketing. Power up email collection for your newsletters, contests, launches, events, discounts, and more. The drag-and-drop functionality is simple and their customer service is prompt and friendly. I would like a little more ability to adapt the web page designs. But, then, I'm not a coder, so what can I expect. The interface is very flexible. The email builder is perfectly workable but lacks the visual builder of, say, Mailchimp. KOL is a little expensive. The ability to get a landing page with viral marketing tools and lead capture up quickly and professionally. * We monitor all KickoffLabs reviews to prevent fraudulent reviews and keep review quality high. We do not post reviews by company employees or direct competitors. Validated reviews require the user to submit a screenshot of the product containing their user ID, in order to verify a user is an actual user of the product. Hi there! Are you looking to implement a solution like KickoffLabs?